LONDON (AP) — Arsenal ended Ole Gunnar Solskjaer’s unbeaten run in the Premier League with a 2-0 win over Manchester United on Sunday to leapfrog its rival into the top four. Granit Xhaka scored with a swerving long-range strike in the first half and Pierre-Emerick Aubameyang doubled the lead from the penalty spot in the 69th minute at the Emirates Stadium. The win puts Arsenal back into fourth place, two points ahead of United, and handed Solskjaer his first league loss since taking over as United manager in December. The Norwegian had 10 wins and two draws in his first 12 games. Arsenal is now just one point behind north London rival Tottenham, with United fifth and Chelsea sixth, in an increasingly tight fight for the Champions League spots. 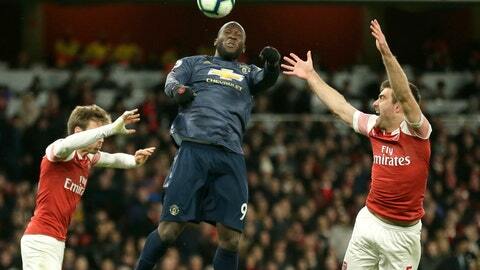 The result was a reversal from the team’s fortunes in France in midweek as well, when United beat Paris Saint-Germain 3-1 to advance in the Champions League and Arsenal lost 3-1 at Rennes in the Europa League. Arsenal coach Unai Emery deployed a surprisingly offensive-minded lineup with Mesut Ozil, Aubameyang and Alexandre Lacazette in attack, and the hosts put United under pressure from the start. They had already created a number of half-chances when Xhaka gave his team the lead in the 12th minute with a shot that seemed to catch goalkeeper David De Gea by surprise, totally wrongfooting the Spaniard as it dipped into the far corner from 25 yards (meters) out. United came close to equalizing several times, though, with Fred hitting the post and Romelu Lukaku – who had also hit the crossbar early on – denied twice from close range by Bernd Leno. Despite United enjoying a period of sustained pressure after the break, Lacazette was bundled over in the penalty area by midfielder Fred, and Aubameyang calmly converted from the spot in the 69th. Aubameyang had missed a late penalty in last weekend’s 1-1 draw at Tottenham but sent De Gea the wrong way to score his 17th league goal of the season. Arsenal’s celebrations for that goal were marred by a fan running onto the pitch, shoving United defender Chris Smalling before attempting to join the home players’ huddle. The pitch invasion came just hours after a fan ran onto the field in the Championship derby between Birmingham and Aston Villa and attacked Villa’s Jack Grealish. Marcus Rashford had one final chance to pull a goal back for United in injury time, but headed straight at Leno.